Amazon has lowered it’s cheapest Kindle to only $139 which is quite cheap compared to the iPad at $499 – but of course there are some other differences too. Now, the iPad is not primarily an e-book reader, but that doesn’t stop Amazon making a little bit of fun of the iPad on two accounts: Price and readability in direct sunlight. Gotta admit, Kindle does have the advantage on those two points. Other than that, I’d love to see Apple do a TV ad where a guy with an iPad is surfing the web (in color) and then watching a TV show after which the Kindle girl asks how he can do that… lame, I know, but still… funny! (Yes, I have an iPad). I think that Nook is an awesome e-book reader, have one and to read books on it is fantastic. But iPad is better with other stuff. I think over all iPad rocks and is going to dominated the marked. 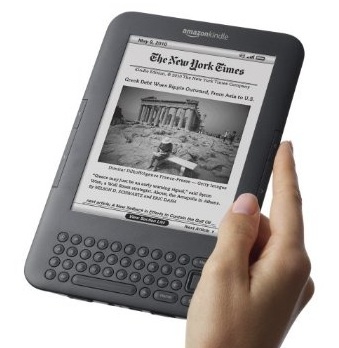 iPad is going to win the “war” but i think kindle will always be a player for those 2 reasons mentioned. I like the ipad but it isn’t practical I will wait till they come out with a better product. Yes but the kindle has problems with sunlight too, after a while the E-Ink actually fades, and people have had to return their kindles for a new one. Kinda like the kettle calling the pot black. Hahahaha, great ad! I definitely vote for Kindle when it comes to reading or using it outdoors in sunlight. But I have no doubt that the competition is going to be tight between Ipad and Kindle.